I have to admit that I’ve not studied Stephen Thompson before. I didn’t know much about him except that he was brought in to Chris Weidman’s camp to prepare for Anderson Silva. Not everyone can mimic Anderson Silva’s style, and after watching him fight Robert Whittaker I started to understand why Weidman worked with him. Thompson is truly a wonderful study. I’m not short of any enthusiasm for evasive counterstrikers with sprinkles of traditional techniques. Even more fun — he switch hits. Background: Thompson’s a kickboxer with a kempo karate base; he holds a sterling record of 57-0 (in amateur and professional kickboxing). He decided to journey into to MMA after a three year leg injury. Since his loss to Matt Brown, he’s now 3-0 in less than a year, giving him a record of 9-1. It appears that one of Thompson’s preferred techniques is the pull-counter, also known as “the rockback counter”. This move relies on anticipating a strike (usually linear) and rocking back the body and head to barely evade the strike to come back with a counter of your own. In most cases, the weight is transferred momentarily to the rear-foot and then quickly shifted forward for the cross. With Thompson he rocked back in order to try and throw the cross over-the-top of Whittaker’s jab (and in these instances failed). It’s key to note that Thompson is comfortable with evasion — generally inviting his opponents in with hands low in both orthodox and southpaw stances. Whittaker however, wasn’t quite committing enough for Thompson to tag him (it also seems that Thompson did not have the accuracy to land consistently if Thompson didn’t over-commit). So Thompson used more of his defence to draw Whittaker in (analogous to Anderson Silva and Lyoto Machida). Thompson stays cognizant of Whittaker’s left-hand (pretty much checking it) as he rocks back away from the right, off-balancing as Whittaker starts to over-commit. Thompson’s southpaw evasive tactics seemed to get Whittaker to commit more than he would in an orthodox stance. Notice how the head is past the knee — a technical sin that causes one to lose balance. Compared to the examples above, Whittaker was comfortable with leading with the jab but not when leading with the rear-straight (in an orthodox vs southpaw situation, the rear-straight is more utilized because the lead-hand is generally in the line-of-fire). As Whittaker falls forward with his over-commitment, he eats a nice rear-straight. Up to this point, Thompson has been trying to establish a 1-2 from orthodox or the rock-back counter. The success rate was not high, where as his southpaw tactics were. He had yet to figure out how to land his orthodox strikes accurately — but the rear-straight was getting quite close in several cases. His southpaw combinations were much smoother. First he throws a 1-2 (miss), switches to southpaw and goes for a rear-straight to the body followed by a right-hook (miss) to the head as Whittaker comes in. When a fighter is able to get away with switch-hitting all the while being evasive… it greatly confuses the opponent. And then you sprinkle on some techniques like the hook-kick — think “spinning back-hook kick” but without the spin — and it’s enough to subdue most opponents, making them hesitate and more desperate. I’ve been wanting to see more of this in MMA for quite a while now — it’s a beautiful technique generally seen in karate to steal points (and more rarely, hurt the opponents). 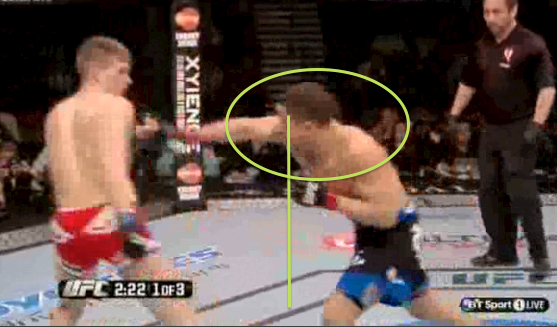 The trajectory of the kick makes it quite difficult to see and in southpaw vs. orthodox it’s a very speedy blow. And then Thompson found his mark by parrying Whittaker’s left, coming with a left-hook to straighten Whittaker’s posture and then coming in with a rear-straight. Eventually, after establishing various strikes in southpaw, Thompson reverted back to orthodox but did not try the pull-counter or 1-2 lead. Instead, he waited for Whittaker to attempt a jab (very uncommitted because it was read), he parried it, just as he smoothly transitions to the left-hook — uprighting the posture of Whittaker — and sets up a beautiful rear-straight down the centerline. It’s also interesting to note that Thompson shifted to southpaw (maintaining balance) and ready to evade and counter more. After this knockdown, Thompson went on to finish a hurt Whittaker by repeating the left-hook into rear-straight in orthodox. In my first study of Thompson, I found out that he’s got a deep bag of tricks. He’s an evasive counterfighter with an exceptional ability to read the opponent. Sprinkle in the ability to switch-hit and some traditional techniques, and he quickly became one of my favorites.